Such is the struggle of the family of an American pastor recently sentenced in Iran to eight years in prison for his Christian beliefs. The couple's two children "miss him terribly. They cry, they ask for him," wife Naghmeh Abedini says. "They're struggling every day." 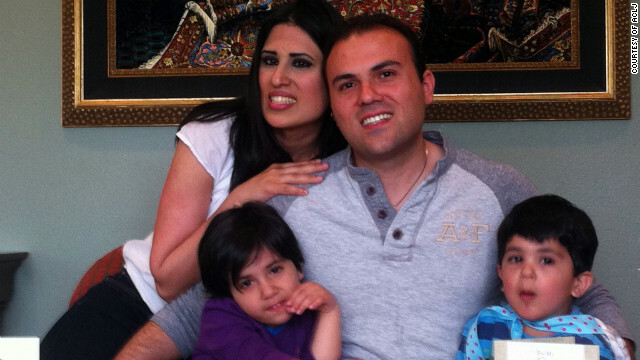 Her husband Saeed Abedini, a U.S. citizen of Iranian birth, was arrested and charged in Iran last June during a visit. Abedini, 32, converted to Christianity from Islam and then became a pastor, living in Boise, Idaho. He has reportedly been detained in Tehran's notorious Evin Prison since late September. In the Islamic Republic of Iran, a Muslim who converts to another faith can face the death penalty. "They've charged him with Christian gatherings, and they're saying it is a threat to the national security," Naghmeh Abedini said. « Previous entryWhy is the pope washing prisoners’ feet? CNN thank you for this story on Saeed Abedini and his Family. I HOPE CNN DOES A UPDATED STORY ON SAEED ABEDINI AND HIS FAMILY. Is there an update to what is going on with Pastor Saeed in Iran? Pastor Saeed i hope is able to come back to America and tell People here about what Iran is really like and how different we operate vs. other Countries.Maybe People would be more grateful for the U.S. and its freedoms. In Roman times we read, it was the behavior of the Christians which converted more Romans to Christianity than anything else. I wonder how his jailers feel about him and also about his religion!